If you’re going to read this, you better “buckle up;” it’s going to get rough. There is a truck driver who comes to my work site to deliver compressed calibration gas. He is nice enough but………Yesterday he asked why he had not seen me in a while. I told him I was on vacation. He asked me where did I go. At one point I told him London. “Wow!” He said. “Wow, London; that is so cool.” He then said, “Hey, is that place still loaded with foreigners?” Oh boy, here we go………”Yea it is,” I said. “There are stinking Americans running around everywhere, and the English call them the foreigners.” Before I could say any more, he launched into Denmark’s push-back against Muslims, “Crooked Hillary,” “Bernie the socialist Sanders” giving free prime rib and beer to all the poor people at the market ( I told him I wanted to shop where he was shopping and get some of that free prime rib), and how everything is “O’bams” fault. I suggested he could go back to Russia like his president; “Crooked Donald.” He actually bristled at that idea. “Russia?” he said, how about Paris? “Is Paris in London?” he said. “No,” I said, “Paris is in France.” I was tempted to have him take off his safety helmet and see if I could see the wires for the local “hate radio” Satellite down-feed cabled into his head. Last week, a motorcycle drove up my street and past my house. On the back of his bike was a flagpole and attached was a very large American Flag. Actually, my initial thoughts were not how dumb I thought the flag looked or how I suspected that the display of the flag was not about patriotism but more about “screw you to anyone who doesn’t think like me.” No, my first thought was how dangerous it looked; the possibility that the flag being so long could at some point get sucked into the wheel and cause a serious accident. My second thought was how exhaust fumes from the bike were dumping all over the flag and that was disrespect for the flag all by itself. All of this was nothing compared to my shock and anger when I pulled up behind the guy in my car and got a closer look at the flag. 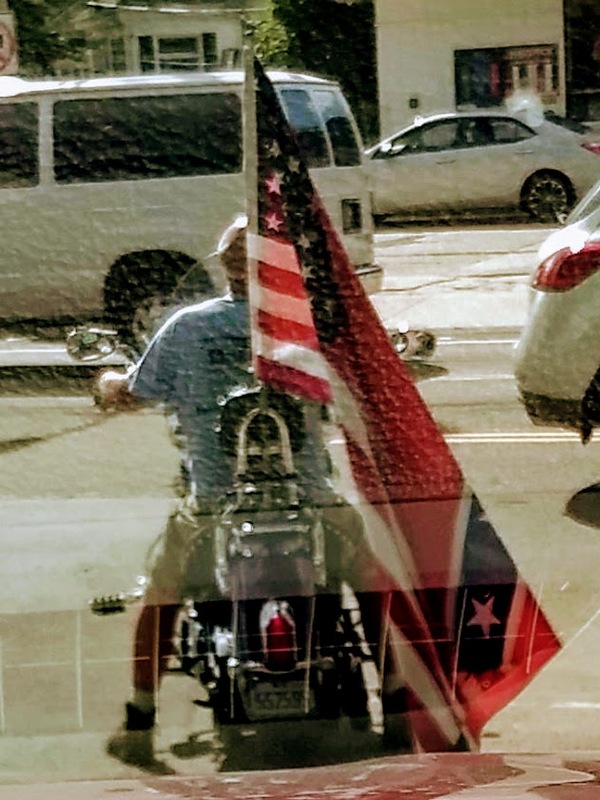 The man had taken the large American Flag, and then double stitched the same size confederate (small C) flag to the other side of it. Some of you “out there” may be thinking; that is his “freedom of expression.” I will agree with that, but if “anyone” somehow believes that his expression is anything but racist and approval of slavery than we would be far more down the line than “agreeing to disagree.” Simple facts; the confederate flag was the ultimate and official symbol of the confederacy during the U.S Civil War. The prime reason for the “South” to secede from the Union was its desire to keep slavery. If somehow you don’t think slavery is racist, you don’t think waterboarding is torture. In the end, the confederate flag is the prime display of racism and inhumanity. As disillusioned as I have become with my own country of America, I still hope the flag stands for better ideas and moral values than slavery. So where does this blog leave me today? Not a day goes by where I don’t read some article about the rampant spread of fear, hate, violence and brutal intolerance for others. It’s one thing to read about it; it’s another thing to have it driving past your house, or standing one foot in front of you telling “you” it’s the American way. Your ‘observations’ of the bizarre world around us are typically humorous, insightful, educational, entertaining, and yes, bizarre… which gives even more power to this ‘different’ blog, one that so forthrightly and unequivocally takes a strong stance against racism, fear, and violence. No jokes. So well done. The ‘middle road’ can be an attractive option for someone who writes a general interest blog, and and who seeks a little ‘market share’. Instead, you put your heart on your sleeve for all (even those who are ‘nice enough’) to see, and let the chips fall as they may. Good for you. In these dangerous and challenging times, we need more public voices like yours. Yep, yep. All too true.